During the course of three hours last Thursday afternoon, members of a local artists' collective welcomed dozens of hopeful artists into the lower meeting room of the town library. Artists were submitting works for the 48th Annual Spring Juried Art Show & Sale hosted by The Society of Creative Arts of Newtown, which opened the following morning. Three artists - Chris Ivers, Robertz Lenz, and Christopher Magadini - selected 130 works of art for the nine-day exhibition. The trio also made their decisions for 11 awards, formally announced Sunday afternoon during the exhibition's opening reception and awards ceremony. Ralph R. Schwartz was the lead honoree, receiving The Larry Newquist Award for Excellent in Show. SCAN's equivalent of a Best in Show award, the honor is accompanied by a $600 cash prize. Mr Schwatz earned the honor for one of two magnificent pastel works entered into the show, "Venice Sunrise." Adele Morors received The Caraluzzi Family Award ($50) for her watercolor, "Take Your Pick." Works on view in the exhibition are new and have not been featured in a previous SCAN exhibition. The majority are available for purchase. Of those honored with awards over the weekend, the paintings by Mrs Newquist and Ms Oppel are not for sale. The 48th Annual SCAN Spring Juried Art Show & Sale is on view until June 16 during regular library hours: Monday through Thursday, 9:30 am to 8 pm; Friday, 11 am to 5 pm; Saturday, 9:30 am to 5 pm; and Sunday, noon to 5 pm. The offering includes oils, watercolors, acrylics, pastels, graphics, and mixed media. Although the prospectus listed prints and sculpture as being allowed, none were accepted into the show. 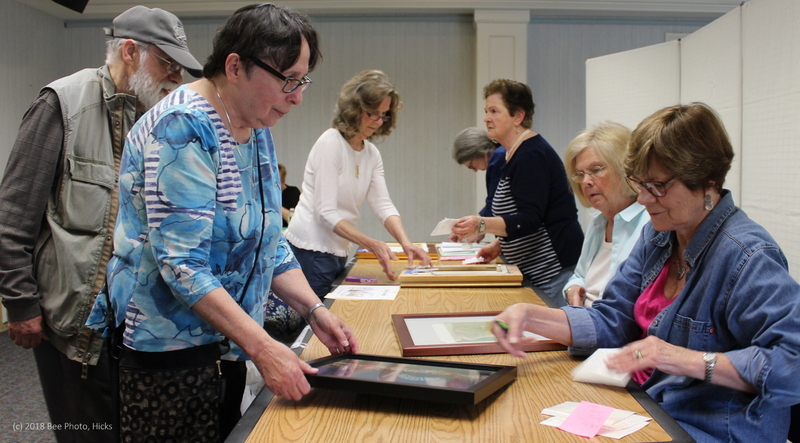 Elaine Schwartz, second from left, presents a pastel done by her husband to Arline Corcoran during the receiving of works for SCAN's Spring Juried Art Show & Sale, June 7 at C.H. Booth Library. Ralph Schwartz, on the left, entered two works into this year's juried exhibition, and earned Best in Show honors for one of them.Also working during the receiving were, continuing left from the Schwartzes, Mary Karen Merrill, Marcia Cavanaugh (partially hidden), Aline LaPointe and Caroline Kilpatrick.